What happens when you get a document management solutions provider or a vendor who is already well known in the market? You simply take them on board and accept the solution without researching about their suitability for your organization needs or analyzing their product. This usually happens when the brand is well known already and you think that there is no need to further investigate on the quality and suitability of product they have to offer. Many IT departments of big companies fail to go deep into the water to test the matter. The lesser known fact is that not every document management company is a well known, globally established brand; it might be simply a small document management solution provider with a good but lesser known product. Some document management providers offer the same kind of features that big vendors offers but at the fraction of cost while some offer limited features but still cover most of your document management needs. Docsvault is one such solution; though Docsvault has a presence in over 20 countries with thousands of customers, it still is a growing company and offers document management solutions at a fraction of the cost. How can they provide same features at a lower cost? There are some relatively lesser known document management solutions that have emerged successfully in a very less time and offer you a good combination of value and capabilities. 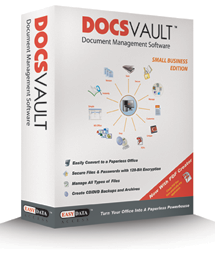 Docsvault is one of them; Docsvault Small Business Edition caters to document management needs of small to medium businesses. Docsvault SB offers a wide range of features such as comprehensive search, integrated scanning, version control, fine-grained security, document profiling and many more. Most mid-sized companies need only these features to control their documents; this is why, it does not make sense to invest in enterprise software that offers abundant services which are of no use to them. The lesser services offered, the lesser you have to pay. On the other hand, if you need a total solution, then Docsvault Enterprise Edition helps you get all the features but without paying through your nose. This is because Docsvault spends most of its earnings on research and development unlike other companies that spend more on advertising and marketing rather than improvement of their product. You need to keep your eyes open and try out document management software solutions that don’t cost as much as their counterparts but provide real solutions. This may be an unthought-of policy for a reserved IT department but time can prove the validity of this decision. This is why it makes sense to revise your IT policies and find the best document management solutions. The IT department that is in charge of selecting document management solution should keep in mind the need of the hour as well as the long-term policy of the company. They must remember the usual policy of buying what everyone else is may not fit pretty well in all circumstances. – The policies that include transmission of sensitive data through HR, customer services, accounting systems may require enterprise-level collaboration tools. So all the products should be reviewed in detail and rigorously. – Before deriving upon your IT policy for selecting a document management vendor, you might want to consider as to how you’ll benefit from the capabilities and innovation that the document management vendor has to offer to you. Most importantly, you need to figure out if your policy meets the needs of a large number of people outside your organization such as your customers, shareholders, etc. and doesn’t stay limited to your organization. – If you are running a small company, choosing an enterprise-level solution might not give you enough return on your investment. Under the circumstances, make a list of all the challenges you face and then evaluate each feature and see how it will make a difference in your organization.